Today, I had the opportunity to review three different products from House of Marley. In case you are wondering, they are related to the family of the late Bob Marley. At least, I believe they are, because when I first encountered them at CES 2012, Rohan Marley was on deck to talk about them. I can’t seem to find any more Marley connection, but the company has a commitment to principles of superior quality, earth-friendliness, and a commitment to global charitable causes. As a result, their products feel more natural than most tech, and I am not certain how to describe it without these examples. I’ll start with the Riddim BT, a Portable Audio System that is essentially a Bluetooth speaker, but I feel like I am underselling it by giving it such a brief explanation. I’ll get the specs out of the way and say that it is Bluetooth 4, and the set-up with its voice prompt was quite simple. The sound is quite good with 2 x 8W 1.5-inch full range active drivers, a 2 x Passive bass radiator, and I’m trying out the sound as I write this. Man, it can really blast! 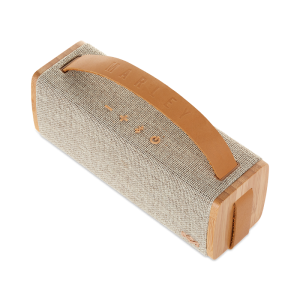 What makes it feel like the Riddim BT has come out of the House of Marley is that the sides feel made of wood (bamboo), and there is a removable leather strap. I’m assuming that you have to do something pretty complicated like unscrewing the screws the hold it in. I admired the versatility of the strap, as you can hold it from the top or on the side. 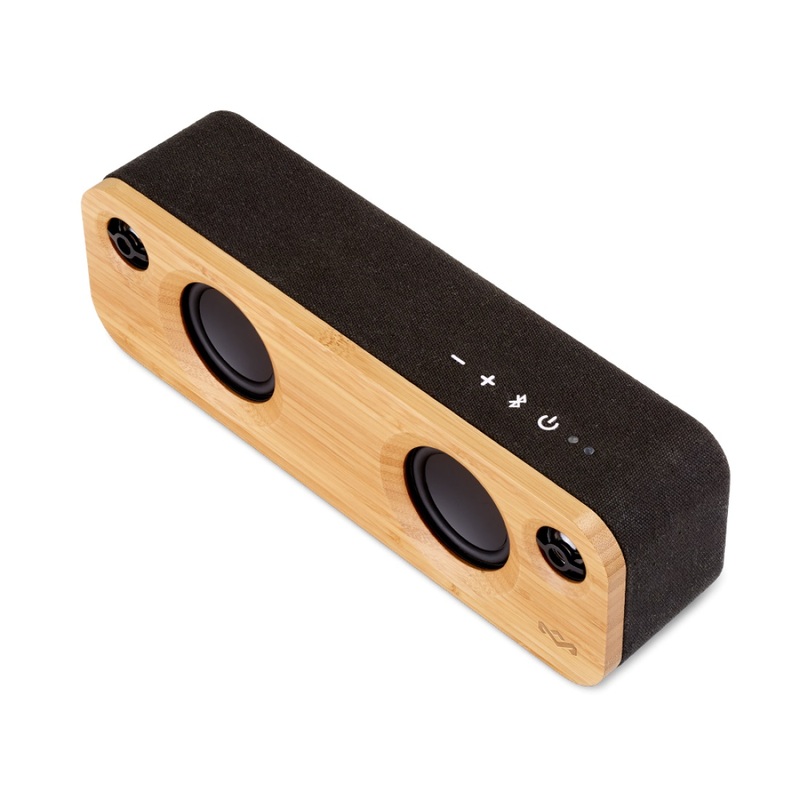 You can purchase the Riddim BT for $129.99 on the House of Marley site. And now to talk about two more House of Marley products. Now it is time to talk about the Get Together Mini, another Portable Audio System with Bluetooth 4.1 capability. I would say that it isn’t too different than the Riddim BT, because it is a Bluetooth Speaker. It also has bamboo and also has a 10 hour playtime. Oh yeah, did I mention that the Riddim BT has a 10 hour playtime? It does. Oh, the Get Together Mini doesn’t have a leather strap. It does have 2 x 2.5″ Woofers, 2 x 1″ Tweeters, and a passive radiator. Oh, it has a USB port for charging devices. So yes, it is designed more for a desk or a table than a portable job. However, if this is something that you want, you should go to the House of Marley site and pay $149.99 for it. Now, let’s end with the last item with Bag of Riddim 2 Portable Audio System. If you are wondering why Riddim shows up on these products, it is because “Riddim is the Jamaican Patois pronunciation of the English word ‘rhythm’, but in calypso, soca, dancehall and reggaeton parlance it refers to the instrumental accompaniment to a song”. I got that from Wikipedia, by the way. Anyway, the Bag of Riddim 2 Portable Audio System is kind of a cross between the Riddim BT and Get Together Mini. Like the Riddim BT, it is portable, but in a different way, which I will explain later. As for how it compares to the Get Together Mini, it is actually bigger, which is strange, because the Get Together Mini isn’t made to portable. 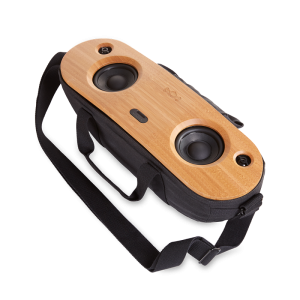 You can see that there is a bag thing that surrounds the speaker, and it is a great way to carry this great sound with you. I have to admit, it is a really good idea, and I don’t see a lot of other companies “borrowing” this design. As for the specs, it has 2 x 3.5″ Woofer and 2 x 1″ Tweeter, as well as some bass ports. This one comes with a USB for charging a device, and it has 10 hours worth of playtime. This one has a 12V AC adapter, but what makes this really great is that it has a bag that you can zip closed. So you can put that adapter and its various plugs in that small pouch. I personally recommend all of these products, and if you want the Bag of Riddim 2, you can go to the House of Marley site and lay down $299.99.